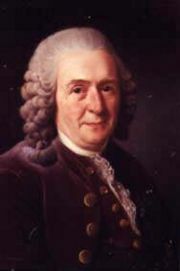 Carolus Linnaeus popularized the use of the binomial nomenclature within the scientific community. In biology, binomial nomenclature is the formal system of naming species whereby each species is indicated by a two-part name, a capitalized genus name followed by a lowercase specific epithet or specific name, with both names italicized (or underlined if handwritten, not typeset) and both in (modern scientific) Latin. For example, the lion is designated as Panthera leo, the tiger as Panthera tigris, the snowshoe hare as Lepus americanus, the blue whale as Balaenoptera musculus, and the giant sequoia as Sequoiadendron giganteum. This naming system is called variously binominal nomenclature (particularly in zoological circles), binary nomenclature (particularly in botanical circles), or the binomial classification system. Species' names formulated by the convention of binomial nomenclature are popularly known as the "Latin name" of the species, although this terminology is frowned upon by biologists and philologists, who prefer the phrase scientific name. The binomial classification system is used for all known species, extant (living) or extinct. The species is the lowest taxonomic rank of organism in the binomial classification system. Naming the diverse organisms in nature is an ancient act, even referenced in the first book of the Bible: "The Lord God formed every beast of the field and every bird of the air, and brought them to the man to see what he would call them; and whatever the man called every living creature, that was its name. The man gave names to all cattle, and to the birds of the air, and to every beast of the field" (Genesis 2:19-20). Given the multitude of diverse languages and cultures, however, diverse common names are given to the same species, depending on the location and local language. For example, the "moose" of North America, Alces alces, is the "elk" of Anglophone Europe, while "elk" in North America refers to another species, Cervus canadensis. The use of binomial nomenclature allows the same name to be used all over the world, in all languages, avoiding difficulties of translation or regionally used common names. The hierarchy of scientific classification's major eight taxonomic ranks. Binomial nomenclature deals with the genus and species ranks. a first word, the genus name, is also called the generic name. specific epithet is applied in botany to the word identifying the species. Species names are usually typeset in italics; for example, Homo sapiens. Generally, the binomial should be printed in a type-face (font) different from that used in the normal text; for example, "Several more Homo sapiens were discovered." When handwritten, species names should be underlined; for example, Homo sapiens. Each name should be underlined individually. In zoology, the specific name is never written with an initial capital. In botany, an earlier tradition of capitalizing the specific epithet when it was based on the name of a person or place has been largely discontinued, so the specific epithet is written usually all in lower case. All taxa at ranks above species, such as order or phylum, have a name composed of one word only, a "uninominal name." Two of the subspecies of olive-backed pipit (a bird) are Anthus hodgsoni berezowskii and Anthus hodgsoni hodgsoni. The Bengal Tiger is Panthera tigris tigris and the Siberian Tiger is Panthera tigris altaica. The tree European black elder is Sambucus nigra subsp. nigra and the American black elder is Sambucus nigra subsp. canadensis. The scientific name should generally be written in full. The exception to this is when several species from the same genus are being listed or discussed in the same paper or report; in that case the genus is written in full when it is first used, but may then be abbreviated to an initial (and period) for successive species names. For example, in a list of members of the genus Canis, when not first in the list Canis lupus becomes C. lupus. In rare cases, this abbreviated form has spread to more general use; for example, the bacterium Escherichia coli is often referred to as just E. coli, and Tyrannosaurus rex is perhaps even better known simply as T. rex, these two both often appearing even where they are not part of any list of species of the same genus. The abbreviation "sp." is used when the actual specific name cannot or need not be specified. The abbreviation "spp." (plural) indicates "several species." These are not italicized (or underlined). For example: "Canis sp.," meaning "one species of the genus Canis." For example Corvus cf. splendens indicates "a bird similar to the house crow (Corvus splendens) but not certainly identified as this species." For example: Amaranthus retroflexus L. or Passer domesticus (Linnaeus, 1758)—the latter was originally described as member of the genus Fringilla, hence the parentheses. When used with a common name, the scientific name often follows in parentheses. Mycology (study of fungi) uses the same system as in botany. The genus name and specific descriptor may come from any source. Often they are ordinary New Latin words, but they may also come from Ancient Greek, from a place, from a person (preferably a naturalist), a name from the local language, and so forth. In fact, taxonomists come up with specific descriptors from a variety of sources, including inside-jokes and puns. However, names are always treated grammatically as if they were a Latin phrase. There is a list of Latin and Greek words commonly used in systematic names. The genus name must be unique inside each kingdom. It is normally a noun in its Latin grammar. the common noun genitive form (singular or plural) as in the bacterium Escherichia coli. This is common in parasites, as in Xenos vesparum where vesparum simply means "of the wasps." an ordinary Latin or New Latin adjective, as in the house sparrow Passer domesticus where domesticus (= "domestic") simply means "associated with the house" (or "… with houses"). Although such stability as exists is far from absolute, the procedures associated with establishing binomial nomenclature tend to favor stability. For example, when species are transferred between genera (as not uncommonly happens as a result of new knowledge), if possible the species descriptor is kept the same, although the genus name has changed. Similarly if what were previously thought to be distinct species are demoted from species to a lower rank, former species names may be retained as infraspecific descriptors. Despite the rules favoring stability and uniqueness, in practice a single species may have several scientific names in circulation, depending largely on taxonomic point of view. For example, the clove is typically designated as Syzygium aromaticum, but is also known by the synonyms Eugenia aromaticum and Eugenia caryophyllata. The adoption of a system of binomial nomenclature is due to Swedish botanist and physician Carolus Linnaeus (1707 – 1778) who attempted to describe the entire known natural world and gave every species (mineral, vegetable, or animal) a two-part name. In 1735, Linnaeus published Systema Naturae. By the time it reached its tenth edition in 1758, the Systema Naturae included classifications of 4,400 species of animals and 7,700 species of plants. In it, the unwieldy names mostly used at the time, such as "Physalis amno ramosissime ramis angulosis glabris foliis dentoserratis," were supplemented with concise and now familiar "binomials," composed of the generic name, followed by a specific epithet, such as Physalis angulata. These binomials could serve as a label to refer to the species. Although the system, now known as binomial nomenclature, was developed by the Bauhin brothers (Gaspard Bauhin and Johann Bauhin) almost two hundred years earlier, Linnaeus was the first to use it consistently, and may be said to have popularized it within the scientific community. Before Linnaeus, hardly anybody used binomial nomenclature. After Linnaeus, almost everybody did. From the mid-nineteenth century onwards, it became ever more apparent that a body of rules was necessary to govern scientific names. In the course of time these became Nomenclature Codes governing the naming of animals (International Code of Zoological Nomenclature, ICZN), plants (including fungi and cyanobacteria) (International Code of Botanical Nomenclature, ICBN), bacteria (International Code of Nomenclature of Bacteria, ICNB), and viruses (International Committee on Taxonomy of Viruses, ICTV). These Codes differ. For example, the ICBN, the plant Code, does not allow tautonyms (where the name of the genus and the specific epithet are identical), whereas the ICZNm the animal Code, does allow tautonyms. The starting points, the time from which these Codes are in effect (retroactively), vary from group to group. In botany, the starting point will often be in 1753 (the year Carolus Linnaeus first published Species Plantarum), while in zoology the year is 1758. Bacteriology started anew, with a starting point on January 1, 1980 (Sneath 2003). Bisby, F. A. 2994. Plant names in botanical databases Plant Taxonomic Database Standards No. 3, Version 1.00. Published for the International Working Group on Taxonomic Databases for Plant Sciences (TDWG) by the Hunt Institute for Botanical Documentation, Carnegie Mellon University, Pittsburgh. Retrieved May 2, 2008.
International Botanical Congress (16th: 1999: St. Louis, Mo. ), W. Greuter, and J. McNeill. 2000. International Code of Botanical Nomenclature (Saint Louis Code) Adopted by the Sixteenth International Botanical Congress, St. Louis, Missouri, July-August 1999. Prepared and Edited by W. Greuter, chairman, J. McNeill, et al.. Konigstein, Germany: Koeltz Scientific Books. ISBN 3904144227.
International Commission on Zoological Nomenclature (ICZN) and W. D. L. Ride. 1999. International Code of Zoological Nomenclature, 4th edition. London: International Trust for Zoological Nomenclature, c/o Natural History Museum. ISBN 0853010064. Sneath, P. H. A. 2003. A short history of the Bacteriological Code International Committee on Systematics of Prokaryotes (ICSP). Retrieved May 2, 2008. This page was last modified on 10 September 2009, at 18:15.